Although the results have not been finalized, Sacramento County Measure B continues to lose ground. The county-wide measure to increase sales taxes for 30-years by 1/2 cent has steadily lost ground since results started posting on election evening. According to tallies from the Sacramento County Board of Elections posted yesterday afternoon, yes on B has 64.81-percent versus no which has 35.91-percent. To be approved, the Sacramento Transportation Authority's sponsored measure needs a super majority of 66.66-percent. With regards to how Elk Grove voters viewed the measure, results as of yesterday afternoon are slightly ahead of county totals. Yes votes totaled 17,035 compared to 8,843 no votes, or 65.81-percent and 34.17-percent respectively. Passage of Measure B is a crucial item for the City of Elk Grove's budget over the next several years. The Elk Grove City Council, led by Mayor Gary Davis and Mayor-elect Steve Ly, have decided to defer $8 million in annual road maintenance for the last four years while it has pursued a host of still unfinished discretionary projects including a multi-million soccer facility and stadium. In testimony offered in October 2013, former public works director Richard Shepard said that the City needed to expend at least $8 million annually just to keep city streets in their current condition. He also noted if maintenance was deferred beyond the time of his testimony that annual cost will escalate. 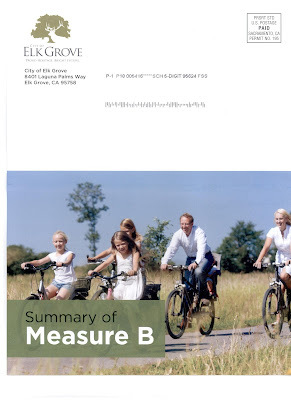 Measure B is seeking the additional tax money to pay for road maintenance of streets and roads throughout the county as well as other transportation needs. If B fails, Elk Grove City Council members have said in council meetings they would consider pursuing a local sales tax increase to pay for the cumulative maintenance funding deficiency.